Cogan Nursery School has become the first nursery school in the Vale of Glamorgan to receive the prestigious National Quality Award of the Welsh Network of Healthy Schools Scheme. Bringing together 14 years of work by staff, children and parents, to reach the high standards of health promotion that the nursery now demonstrates, the nursery was assessed for the award in the Summer of 2017. Welsh Government assessors spent almost 2 days at the nursery, talking to staff, pupils and parents, and exploring the many and varied ways in which Cogan Nursery promotes health. The nursery recently held a celebratory assembly, to mark their achievement. An award plaque was presented to Headteacher Pauline Rowland by Councillor Penrose, from the Vale of Glamorgan Council. The nursery is situated on the outskirts of Penarth in the Vale of Glamorgan, and caters for around 86 children aged 3-4 years of age. The assessors noted that there were many highlights during their visit to Cogan Nursery School. They commented that the general ethos of the nursery is outstanding, with good behaviour and mutual respect evident. Staff are supported by a range of training opportunities and by outside agencies, whose work is integrated into a well-planned curriculum. Cogan Nursery runs a weekly gymnastics club, a fantastic opportunity for the children, made possible by one of the teachers being an experienced gymnastics coach. During gym sessions, the hall area is transformed into a wonderful sight – with children laughing and having fun as they develop their physical skills in a safe and happy environment. Support for pupils who are shy, lack confidence or the ability to communicate, is provided through a Chatter Group, which helps to improve their social development and confidence. The nursery cafe provides a different type of food each day – bread, crackers, fruit, vegetables and yoghurt. Pupils sit with a member of staff learning about the food and how to prepare it. Fruit and vegetables are grown in the garden – the produce is picked, prepared, cooked and eaten involving pupils in the process. The nursery has a wonderful outside space that enhances pupils learning and physical development. Specific highlights are the mini beast area, bird hide, hill slide and gardening ‘shop’. A commitment to environmental activities is shown through their achievement in the Eco Schools programme, and the renewal of the Fairtrade ‘Fair Achievers’ award. 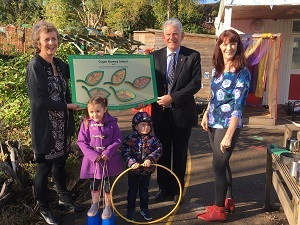 Pictured are Councillor Bob Penrose, from the Vale of Glamorgan Council, Headteacher Mrs Rowland (holding plaque) and teacher and Healthy Schools Co-ordinator Mrs John, along with children from Cogan Nursery.